Please refer to our stock # a1599 when inquiring. 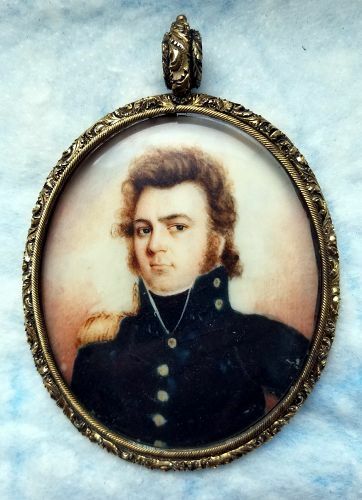 A fine portrait on natural material of a gentleman in an early 19th century officer's uniform. Within the locket is the remnant of the backing paper of the miniature, which was incorrectly and poorly removed. A portion of the name "Miller" can be seen. Prior to this removal, a previous owner had written down on a piece of paper what had been on the backing paper. This is shown in the third photo and gives a portion of the sitter's name as John L. Sc?h?? ?, the name of the artist (Miller) and the date as early 1818. The miniature is in excellent condition with no cracks, chips, restoration, or paint loss. (The white area above the epaulet is not pigment loss, but was intentionally painted in that fashion.) The cast foliate case is also in excellent condition with a glazed rear aperture. The bezel around the painting does have a crack, which is not major. The sight size of the painting is 2 3/4" by 2 1/4", and the case size is 3 1/2" by 2 9/16". IMPORTANT NOTE: Virtually nothing is known about the artist Isaac Miller aside from information that he was a portrait painter and miniaturist active in New York City between 1816 and 1838, and that his widow, L. Miller, was listed in the 1839 NY City Directory. A large number of reference sources were checked, and it appears that this is the only signed example of Miller's work.